Nicolas Pernigotti writes a detailed tactical analysis about the La Liga match that ended Sevilla 1-0 Valencia. One of the classics of Spanish football was played on Sunday, Valencia CF – Sevilla FC faced each other at the Sanchez-Pizjuan Stadium. No doubt, the match promised more than it gave, because the expulsion of J. Cancelo of Valencia completely distorted the development of the game, and the second ejection only served to confirm the supremacy of the Sevilla team. The development of the match was absolutely uneven, with Sevilla setting the pace from the start, against a Valencia team who tried to defend by positioning themselves carefully, covering the possible overloads of the “Rojiblancos” wide players, and assembling counterattacks mainly aimed to go through players like Santi Mina, argentine Enzo Perez and striker Paco Alcacer. Sevilla FC: Sergio Rico, Mariano, Kolo, Escudero (Krohn-Deli, min 83), N’Zonzi, Krychowiak, Vitolo, Banega, Konoplyanka (Reyes, min 86) y Llorente (Immobile, min 69). Valencia CF: Ryan, Cancelo, Santos, Abdennour, Gayá, Enzo Pérez ( Feghouli, min 63), Fuego, Danilo, Parejo, Mina (Vezo, min 90) y Alcácer ( Bakkali, min 79). Sevilla came into this game on the back of a 2-0 loss in the Anoeta against Real Sociedad and needed a victory to keep them close to the European places. That’s why coach U. Emery fielded a team with an offensive mentality, good ball handling aiming to create quick overloads. Valencia came from their draw against Las Palmas with the same aspirations as their opponents, but at times Nuno E. Santo´s team looked comfortable with the draw. Sevilla took control of the match from the first minute, tending to develop the right side for attacks, where the Banega and Vitolo, who alternated as a winger or striker. 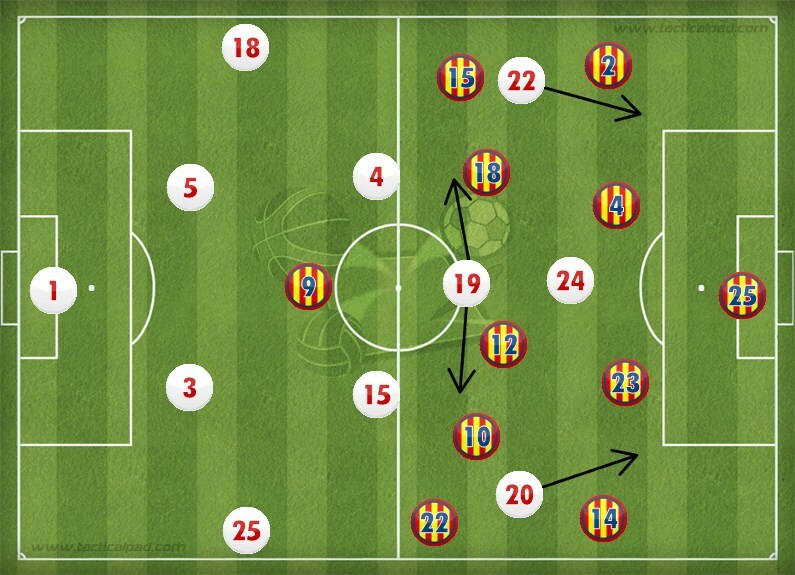 Both these players were looking to combine with Mariano, who constantly made forward runs in order to create overloads on that flank,as shown in the following image, where Vitolo (red square) waits for the projection of Mariano above the free zone (yellow square), trying to get a 2×1 against Valencia´s defender José Gayá (blue circle) who will be overtaken by two men. He either controls Vitolo or covers Mariano´s run but one way or the other, Sevilla have accomplished an advantage. The dynamism and the constant search for spaces was the characteristic of Sevilla´s attack, especially overloading the position of Gayá, but also dragging the rest of the team to the area where Sevilla looked to have a man advantage. 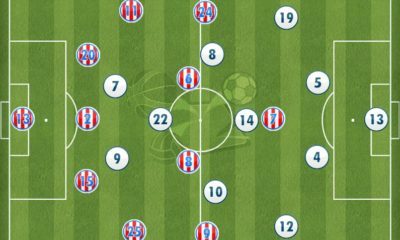 Sevilla organized themselves to break lines in spaces where they had numerical supremacy as shown in the following figure. Valencia achieved little more than some sporadic triangulations between Parejo, Danilo and Enzo Perez. Danilo surprised the home defense sometimes by playing almost as a striker, forming a classic 4-4-2. But the early ejection of the right wing back Joao Cancelo reflects this, and it generated a complete change of scheme for Valencia. Parejo was moved back to defense to cover that area of the field, and in turn Perez was assigned to a defensive role. 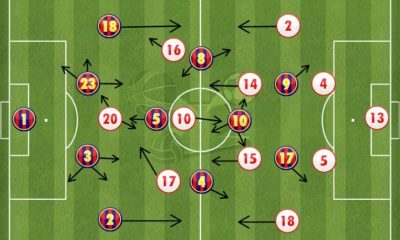 The formation shifted to 4-4-1, with Paco Alcacer more and more isolated. 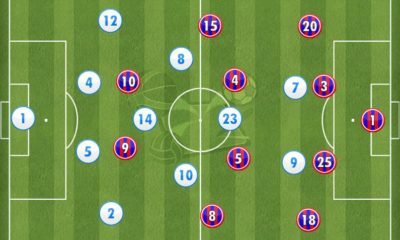 We see Sevilla pressing multiple times in the opponent’s half, advancing their lines, with two defensive midfielders covering the holes and 3 offensive midfielders pressing opponents. The striker Llorente (yellow circle) went after the ball, which prevented the visiting team to play at ease from their goal. Valencia had to resort to long balls, or try to get out with the full backs (red box) dividing the ball. When Sevilla didn’t press, they retreated to 25 meters in front of their goal, covering all areas in a compact block, trying to create fast counterattack chances (green arrows) as shown in the image. We can see how the entire team is within a few meters of each other and how the formation changes from a 4-2-3-1 in attack to a 4-4-2 in defense where Banega partners Llorente to break off and attack should Sevilla recover the ball. In the next image we also see the 4-4-2 defense used by Sevilla, which attempts to keep the rectangular structure – with movements in a block- forming it with the defenders and midfielders (yellow lines) and without ignoring marking and overloads (black lines) with two center backs sheperding the opposing forward. Thanks to one of the mentioned runs from the wing backs of Sevilla, the winning goal was scored. The Sevilla debutant, Escudero makes a forward run and surprises a careless defense. The Valencia player loses his marker (yellow square) and with a precise pass from Banega, Escudero (red circle) takes the ball to the goal surprising the entire Valencia defence. After this, there was no option for Valencia, but to try and find ways to attack, and they did try, but without success. 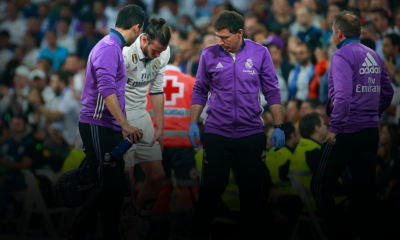 The problem worsened in the 78th minute, when the midfielder Fuego got sent off, reducing Valencia to 9 men. At this point, the most they could do was get to the end of the game, with the deficit staying at 1-0. They played a 5-3 formation, with some sporadic runs from their wing backs, but without any depth in a distorted game. Valencia showed very little when they had numerical equality, with some sporadic maneuvers from Danilo and Perez to show, but nothing that can be considered a point of analysis. The Sevilla defense had little work in general, and pretty much delegated their functions to a midfield that advanced pressing, forcing ball losses in dangerous areas by the visitors. Krychowiak as a midfielder covering spaces, the N’Zonzi playing a box to box role like he did at Stoke, and Banega with the freedom that characterizes him, left no chance for Valencia.